I think this kit is a super investment. You get all the fun nail art tools and stuff in one package, and that too for only $12.24. The rhinestones are of quite a good quality in an assortment of bright colours. You get about 150 in each colour. The dotting tools comes in different sizes and the tiny ends can be also used for marbelising. 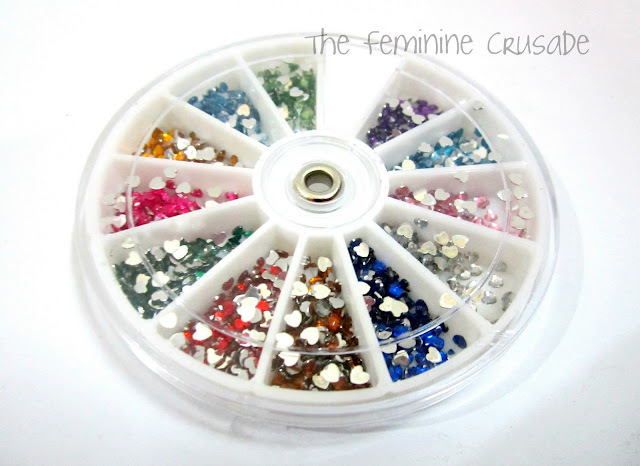 You can also pick the rhinestones with them. All in all, this is one amazing kit and very cheaply priced. If you love nail nail art, this is a must-have! You can buy it here and use the coupon code FEMJ61 to get 5% discount. Disclaimer: This product(s) was sent to me for consideration to review. I was not paid for this review, I am not affiliated with this company and the fact that the product(s) was free does not influence my opinion at all.